Do you know the country named "East Turkistan"? The country is not a member of the United Nations, and is not mapped. The area is usually called "Xinjiang Uyghur Autonomous Region", the People's Republic of China. This area is famous for the Silk Road where Eastern and Western culture were interacted, but has flourished with its own specific culture and history. However this area was conquered by the Qing dynasty in the 18th century, and then became its domain called "Xinjiang" - meaning "new territory" - in 19th century. Through the confusions caused by an unofficial military of Hui, Soviet military, Xinjiang government etc, countries named "East Turkistan" were founded in twice. That is, East Turkistan Islam republic was founded in 1933 under a religious leader, but this country was ended just after half one year. In 1944, some armed uprisings occurred by many groups of Turkic to found East Turkistan Republic. But about one year after, this country was forced to join the Xinjiang government of China because of the Yalta secret agreement between Soviet Union and Chinese Nationalist Party. After that, leaders of the ex-East Turkistan Republic were killed and the country was vanished both in name and reality. At the presence, this area is conquered by the Chinese Communist Party, the winner of battles with the Chinese Nationalist Party. Under severe oppression, many East Turkistan people were killed. Several tens thousands of people were slaughtered for being claimed as "political criminals". The East Turkistan people are still under the oppression of China. Moreover, the imprisonment and execution of political crimes has become severer under the counter-terrorism since the 9.11 terrorism in the United States. The unique culture, language, and customs are beginning to fade by emigration of huge amount of Han people and ethnic cleansing policies. However, this fact is not well known worldwide. Victims in the Islamic world always associate with problems of Iraqi people only, and oppressions of Chinese Communist Party always associate with problems in Tibet and Taiwan only. However, even now the East Turkistan people are suffering. What can we do for East Turkistan people? One person's power is too weak. However, we can propagate this fact to Japan and worldwide for gathering opinions to protest against China and to support East Turkistan. China has been expanding its military hegemony policies not only against East Turkistan but also its surrounding countries. The suffering of the East Turkistan people is never someone else's problem. Now, let's tell the world about this suffering of the East Turkistan people and protest against China! 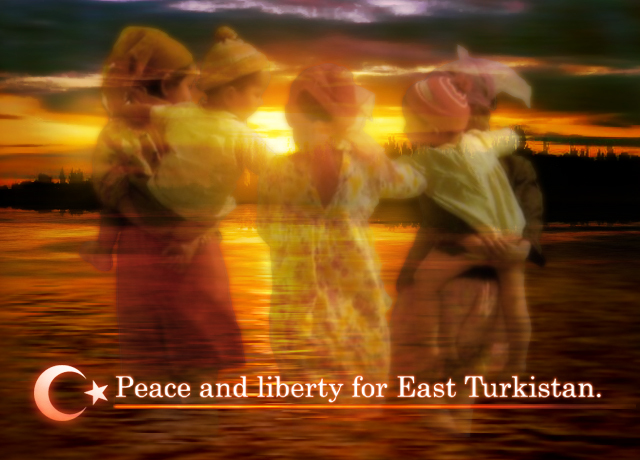 Our wish is NEVER to blindly support violent independence, but to realize peace and liberty for East Turkistan.